Way back, when I was a Boy Scout, the closest thing we had to a multitool was the famous Swiss Army Knife. Not many of us Scouts had more than a folding pocket knife. A few had a genuine BSA folding pocket knife with a blade, a can opener and maybe a screwdriver/bottle opener blade. When a kid pulled a genuine red-handled Swiss Army knife out of his pocket, everyone wanted a chance to hold it and see all the tools and gadgets tucked neatly into the plastic frame. Until 1983 when the first Leatherman “Pocket Survival Tool” was introduced the Swiss Army Knife was as close to a pocket toolkit as you were going to find. Times have changed a little…we’ll go through how to choose the best multitool for your purpose. Just like picking a gun, picking a multitool will depend on what you want that tool to do. Is it going to be for EDC; for your work as a contractor or electrician; will it ride in your range bag for gun repair chores; does it have a home in your tackle box or fly-fishing gear? Because of the very nature of the multitool, many of today’s choices can easily stand in and provide you with tools you need to complete a remote repair and get you back in the game quickly. Understand that some of today’s tools are built specifically with an end-user in mind. Take the Gerber DET 600 for instance. It is made especially for EOD (Explosive Ordnance Disposal) teams. With special wire cutters, wire crimpers and even blasting cap crimpers, this tool helps our military and law enforcement personnel keep our soldiers and cities safe. While I don’t see myself disarming any bombs in the near future, I suppose the DET 600 would be OK in a backpack for everyday camping and hunting chores as well. I’d likely not ever need the crimpers or special cutters, but the tool could help me repair a fly reel or tighten an action screw on a rifle in the backcountry. Remember to leave bomb defusing to the professionals! To review every tool available today would be like doing a review on every 9mm handgun. It would be its own book. So this article will look at the top EDC choices and their features that will serve the majority of readers on a day to day basis. By all means, jump on the company websites and check out all the neat tools they offer. You will likely find the one that really speaks to you as far as looks, features, size, and cost. I have carried an original Gerber Multiplier since 1991. At some point in the early ‘90s, one of the springs in the plier locking mechanism broke and I sent the Multiplier in for repairs. True to the Gerber warranty I received a brand new tool about a week later and it is still riding in my ‘possibles’ pack everywhere I go. The Gerber Diesel Multiplier gets high marks on Amazon. It is a needle-nosed model that is available in stainless steel or black. The Diesel has 12 everyday tools at your disposal, including the Gerber one-handed opening and closing needle-nosed pliers. Other tools include: Wire cutter; partially serrated blade; saw; Phillips screwdriver; small, medium and large flat-blade screwdrivers; can opener; bottle opener and scissors. The Diesel has a length of 4.92” when closed and 6.61” with the pliers deployed. Weight is 8. 6oz. The Diesel comes with a nylon sheath, Gerber’s Lifetime Warranty and is assembled in the USA with US and foreign origin parts. Gerber’s newest addition to the family of multitools is the Center Drive. Some complained that on older Gerber tools the screwdriver was off-center and not easy to use. The Center Drive has a center axis drive that takes full-size driver bits and feels like a real screwdriver. The driver, the spring-loaded plier head, and the knife blade are accessible with the flick of a thumb. Leatherman multi-tools are arguably the best selling pocket tool boxes in history. 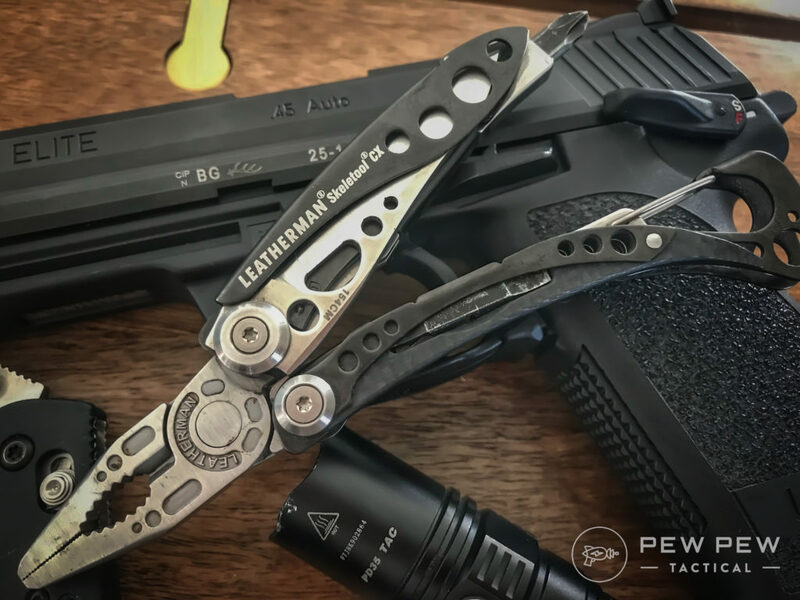 The Wingman is the most reviewed Leatherman tool at this time. It features spring-loaded pliers, scissors, a handy box and package opener and a one-handed-opening outside mounted knife blade. You can purchase the Wingman with a nylon sheath and it also has a handy pocket clip for quick access. The Wingman weighs 7 oz. and measures 3.8 inches when closed. With 14 handy tools, a 25-year warranty and a Made in the USA label. At $49.95 this is a perfect tool for your everyday chores. The Leatherman Sidekick is a pocket-sized version of the original Leatherman tool. It comes with a nylon sheath as well as a handy lanyard ring to attach it to a carabiner or cord. With 14 tools, including spring-loaded needle nosed pliers and a saw this would be a great addition to your camping kit. For the travelers out there take a look at the Leatherman Tread. This is a TSA-compliant multi-tool that acts more like jewelry. The Tread is a bracelet that contains 29 tools in links that you can organize to fit your lifestyle. 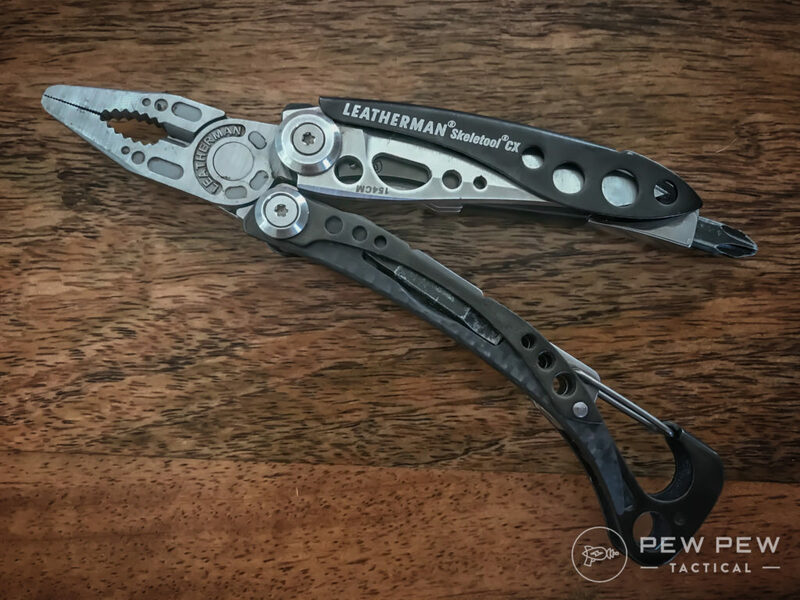 Two editor picks from Leatherman are the Wave and the Skeletool models. The Wave’s biggest selling point is that it is designed to be used with only one hand, something very few multi-tools are designed for. Sure, operating a tool with one hand is normal – but opening all of the tools sure isn’t! With a wide range of tools, the Wave is well designed and lives up to what you would expect from Leatherman. 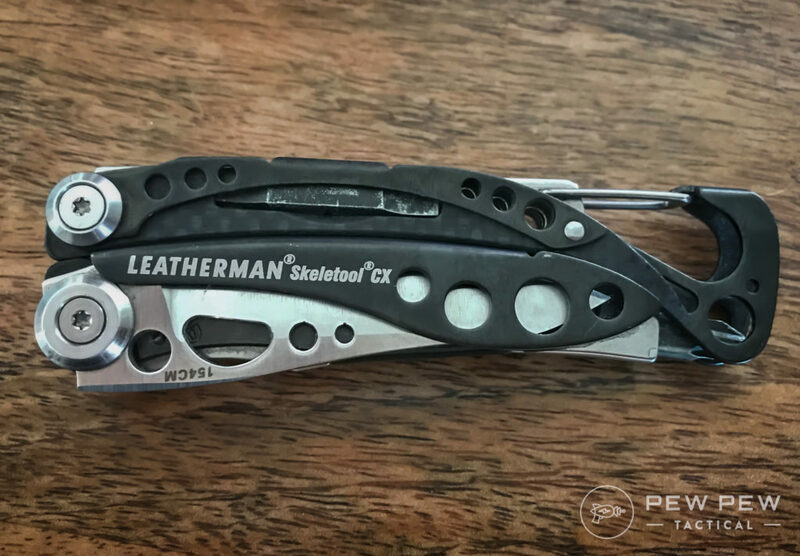 Leatherman’s Skeletool is similar to the Wave and sports the same one-handed design but in a lighter and easier to carry package. If you’re looking for an EDC multi-tool and you don’t wear a heavy belt, this might be perfect for you. What’s your take on the Skeletool CX? SOG is a northwest company with its origin being inspired by the covert “Studies and Observations Group” in Vietnam. What began as a tribute to the knife that special operators carried has become a knife company offering many EDC, tactical, and hunting knives and tools to meet the need of any outdoorsman. The Power Assist in Black Oxide contains 16 stainless steel tools. Residing on one side of the handle are a knife and serrated blade that are accessible when the tool is closed. To open, the SOG Assisted Technology kicks in to make one-handed opening a snap. The needle-nosed pliers benefit from a special compound leverage arrangement that multiplies your holding power. In the handle opposite the knife blades, a handy cover serves to lock tools in place and help keep the inner workings clean. No discussion of pocket tools would be complete without at least acknowledging the Swiss Army Knife. One of the classics is the Climber. Slim enough to carry in your pocket and equipped with 14 everyday tools. The Climber may not have the tough looks and the rugged feel of the tools above, but it will serve you well for years and what outdoorsman would want to be without the all-important corkscrew when kicking back in the tent after a long day in the field. We’ve taken a brief look at some tools available today. A mere drop in the bucket. Victorinox lists 85 medium pocket knives; SOG shows 20 multi-tools on their website; Leatherman has 42 multi-tools, not to mention the cool Tread; and Gerber catalogs 32 one-hand opening multitools alone. The tools discussed represent the most popular brands and designs available today. It’s a place for you to start if you are shopping for a multitool for your kit. Check out the reviews online. If you’re lucky enough to live near a Cabela’s belly up to the knife counter and ask to check out all the offerings they stock. With the choices available today, you’re sure to find the tool that’s right for you. Do you EDC a multitool? What are your goto picks? Carry a specially built one for anything? Let us know in the comments! And if you’re interested in more PPT knife picks, take a look at our Best EDC Knives article!